Hi guys, Today we are going to discuss how to change the password using PHP and MySQLi script. 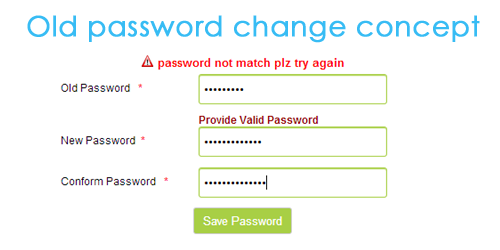 Change password is an important feature for a web application. A registered user can able to change they are old password anytime. It makes a user protect the sensitive pages from hackers. First, you have created HTML form elements with respective text-filed(old password, new password, confirm password). Check the basic validation whether the new password and confirm password is same or not and empty fields validation. After the validation, you have to check old password valid or not. The password is the match then allow to next level. If the old password and new password is same don't allow the change the password. Create sample table name called 'signup' insert manually username, email id, Password(hash key value). If the old password matches with signup table then the new password will upload the database table. Add style code for output message. "Let us sacrifice our today so that our children can have a better tomorrow." Result is null add some data in to the table. bro one dout I cannot login after resetting the encrypted password through the PHP code, but I can login before resetting encrypt PWD?